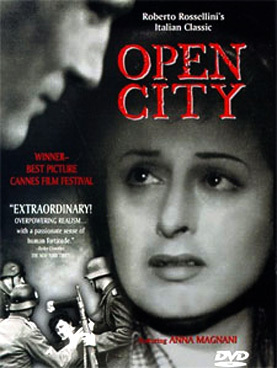 It was Martin Scorsese who alerted me to Roberto Rossellini’s classic Open City featuring prominently, as it does, in his brilliant Italian movie master class My Voyage to Italy. In it, he remembers how, as a child, he would gather in front of the television with his family and members of the neighbourhood, to watch the Friday night movie which, due to the large number of Italian Americans in New York, was invariably an Italian one sub-titled in English. The night Open City was broadcast, he witnessed his grandparents weeping before the screen and understood for the first time the power of cinema. With its magnificent performances, foremost among which is Anna Magnani’s Pina, and its dramatic setting, using locations in and around Rome directly after the Second World War, this film has been hailed as the worlds first example of Neo Realism. It tells the true story of a Catholic priest (Aldo Fabrizi) convinced of his duty to help those in need and in Nazi occupied Rome that included Italian Resistance fighters. His execution at the hands of the oppressors, and those of several other brave souls, held all the pathos that Rossellini needed to make a defiant anti-war statement. He co-wrote the script with Sergio Amidei and Federico Fellini, who was to go on to make his own ground-breaking films, and together they recreated a world still fresh in their memories; full of passionate, hot-blooded heroes and unforgivable villains swirling in their own clouds of cigarette smoke. Shot on stock scrounged from various sources, the print remains scratchy and uneven but this only adds weight to its authenticity as a post-war document. Upon its release in 1945, Time Magazine declared that Open City helped Italy regain that nobility it had lost under Mussolini. According to Scorsese, it became the New Italy’s ambassador to the world, winning the Palme d’Or at Cannes amongst other accolades. It depicts Rome as an open wound or, as Rossellini put it, a raped woman, and it remains a truly impressive black and white image.